The Graveyard of the Atlantic Museum in Hatteras village has received a very large artifact to add to its nautical collection. 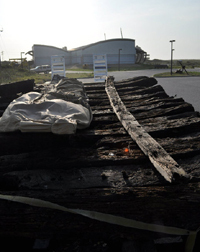 The remains of a shipwreck, perhaps the oldest in North Carolina, were moved 90 miles from the town of Corolla in the Outer Banks to its new home at the museum. The shipwreck was moved along Highway 12 in the middle of the night, when traffic was the lightest. Some onlookers stood along the side of the road, clapping, as the large truck hauling the shipwreck passed in the night. The discovery was made in 2008, when tides and high winds exposed the shipwreck. The frame of the shipwreck was moved off the beach, closer to the Currituck Lighthouse in April of 2010 for protection from the sea. People walking the beach near the shipwreck found coins and other artifacts that date back to the 17th century, the time of Louis XIII of France and Charles I of England. The Graveyard of the Atlantic Museum plans to lift the shipwreck with a specialized cradle and build a structure around three sides to protect it from the elements. Visitors will actually be able to watch as the archeologists progress with studying the shipwreck. There is not a time frame for when this plan is to take effect, but the museum welcomes all visitors to see the shipwreck as it is now. The shipwreck is open to the public behind the museum building, resting peacefully in its new home in Hatteras village.